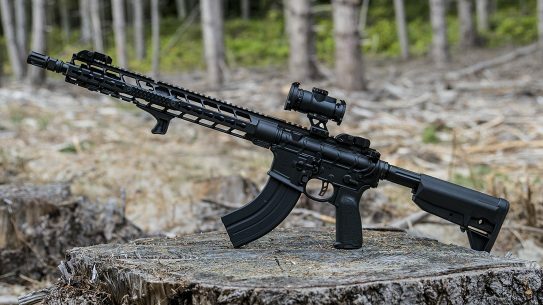 Whether you’re looking for a short-barreled rifle, an integrally suppressed model or a combination of both, Angstadt Arms has you covered. The UDP-9 IC came with an extended magazine release. This model had a new extended release for those needing a bit more speed during a competition. This is a tricked-out SBR version of the UDP-9 that sports a 6-inch barrel with an overall length of 22 inches. The sample UDP-9 IR, which is the quietest of all the models that Angstadt Arms makes because of the barrel and suppressor lengths, had JP Enterprises’ aftermarket Silent Captured Springs recoil assembly. Sometimes the most fun firearms to review are also the hardest to coordinate. Firearms or accessories that are governed by the National Firearms Act (NFA) tend to attract a lot of buzz and attention, but they are not always easy to cover in a review. 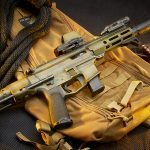 Because of their legal status and classification, it can take a year or more to get approval by the BATFE to carry home a sound suppressor or short-barreled rifle (SBR). 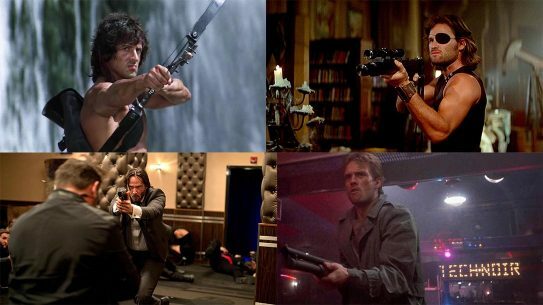 The really rare specimens are the select-fire or fully automatic firearms. You can’t take those home at all—at least none that were manufactured after May 19, 1986, thanks to legislation from the year prior. Newly made select-fire weapons can only be transferred to the military or law enforcement agencies. So, it was a lucky turn of events that allowed us to coordinate a get-together with Angstadt Arms of Charlotte, N.C. 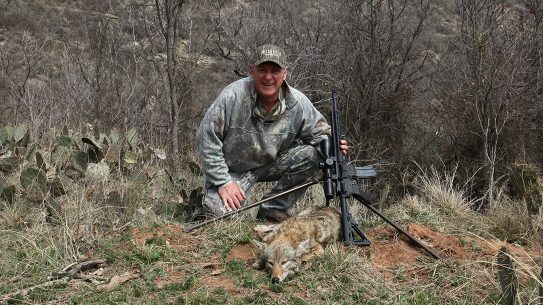 Since the company manufactures firearms that are built with suppressors, are fully automatic and run in the SBR size range, it seemed like a great opportunity to explore. I had already reviewed one of Angstadt’s products in the past and ended up purchasing it, so I was familiar with the type of work the company does along with its overall quality. Angstadt Arms is a rapidly growing concern based in the industrial area of northern Charlotte. 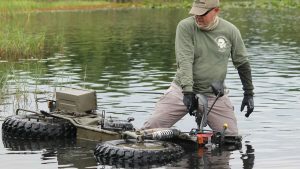 The company has been in business for a little over three years, but it’s already enjoying success on an international scale with its products, and for good reason. The company’s main platform is an AR-style firearm that is built from the ground up to use Glock magazines. 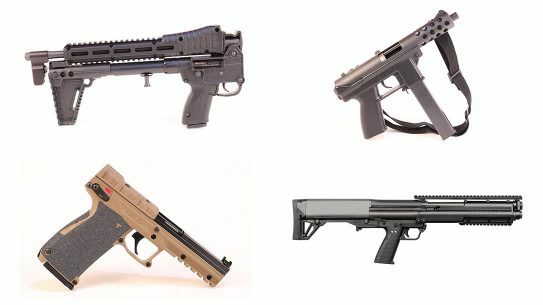 Carbines and pistols are currently being produced, with offerings accepting 9mm and .40 S&W Glock magazines. 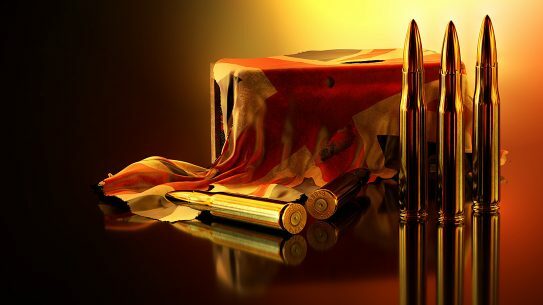 Parts are also available for customers to build their own firearms if they choose. Additionally, as this article is being written, Angstadt Arms is finalizing production on models that will also accept .45 ACP and 10mm Glock magazines as well. So, you can see that things are going quite well for the relatively young company. 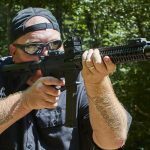 Rich Angstadt has enjoyed over two decades in the gun world, with much of that dedicated to competitive shooting. His entry into manufacturing firearms came about because he wanted something that he just couldn’t buy. 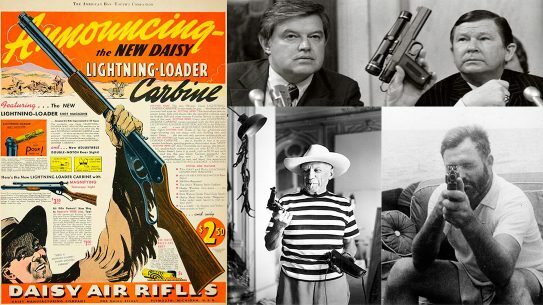 Most 9mm carbines on the market weren’t purpose-built from the ground up in his opinion. He felt they were cobbled together from various sources, without any real adherence to standards or specifications. 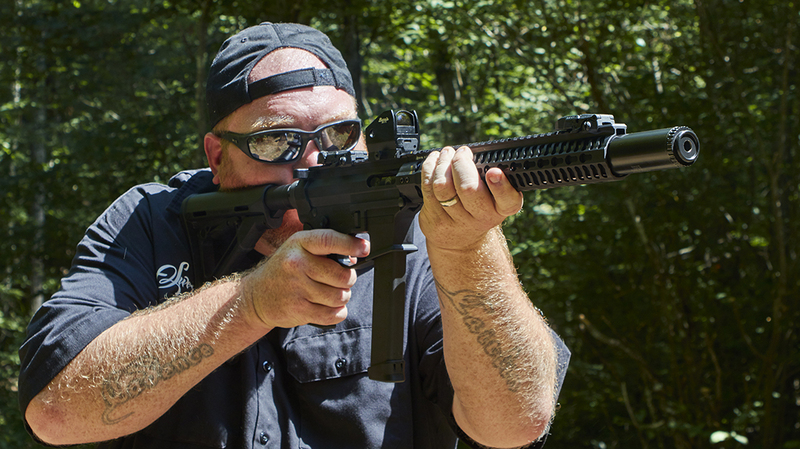 He wanted to change that by building what he believed an AR-style 9mm carbine should be, and so it began. For our range time, the Angstadt folks brought an assortment of products to show off the breadth of their work and to give us a feel for how each weapon handles. Each weapon is a variant of the standard UDP-9, so the parts and specs were very similar, but with tweaks here and there to alter the gun’s purpose. First up was the UDP-9 PDW. This is a tricked-out SBR version of the UDP-9 that sports a 6-inch barrel with an overall length of 22 inches. 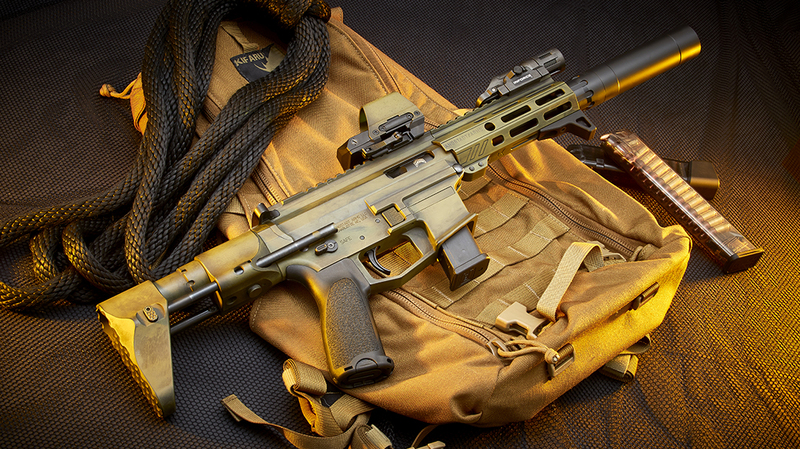 This version wore a custom Battleworn OD green Cerakote finish thanks to Blowndeadline. This finish gave it a more distressed look that I found very appealing. Adding to that appeal were trimmings like the MVB Industries five-position ARC stock, BCM pistol grip and Angstadt Arms handguard. Like the other models, the UDP-9 PDW’s bolt locks back after the last round has been fired. Though not part of the Angstadt package, additional accessories were installed to finish off the weapon and make it viable for use on the range, including an SLR hand stop, a Holosun 510C reflex sight, an Inforce WML light and Rugged Suppressors’ Obsidian 45. 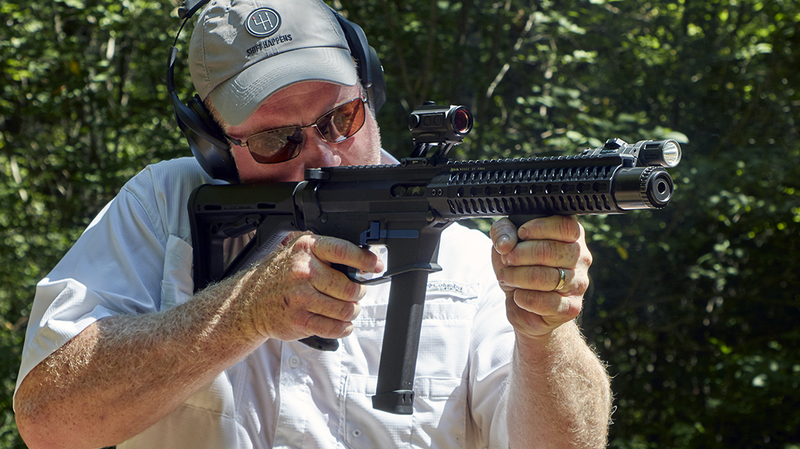 The UDP-9 PDW comes from the factory as a one-stamp gun. It only requires approval from the BATFE on one aspect of its manufacture: the short barrel. 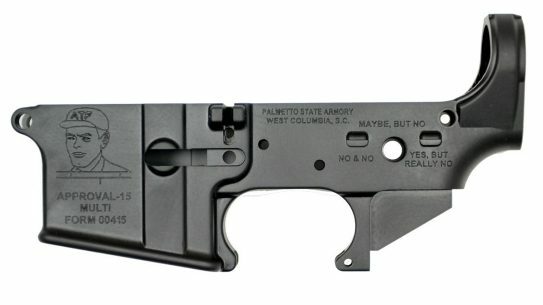 It’s also a semi-auto, not a select-fire design, so that wasn’t a concern. The accompanying suppressor requires its own tax stamp, but it’s not part of the factory package. Also furnished for the get-together were two of Angstadt’s integrally suppressed models: The UDP-9 IC and UDP-9 IR. The “C” stands for carbine, as the UDP-9 IC is an SBR. The “R” stands for rifle, as that model is long enough to be considered a standard rifle. That designation is possible because the suppressor core is permanently attached to the barrel. Of the two integrally suppressed models, the test carbine was select-fire and the rifle version was semi-automatic. As Rich Angstadt pointed out, the company can make any of its models select-fire upon request by a government agency. 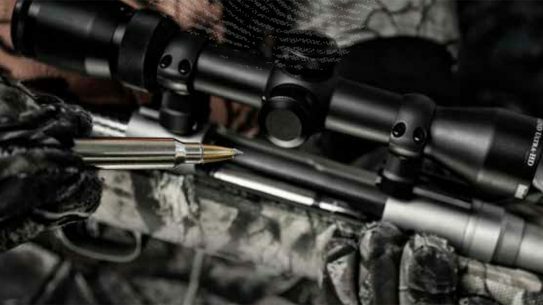 If you did order the integrally suppressed carbine version with a semi-automatic action, that would be a two-stamp gun: one approval stamp for the integral suppressor and one stamp for the short barrel. The suppressors for these models are built by KG Made Firearms through a joint project with Angstadt Arms. As mentioned, they are permanently attached to the barrels and have titanium sleeves with steel cores. For the “I” series of Angstadt Arms weapons, handguards from ODIN Works are used because of the extra width of the sound suppressors when compared to standard barrels. Speaking of barrels, the integrally suppressed models have barrels that are ported with 16 holes. These ports allow the user to adjust the velocities of fired rounds to ensure the right speed is maintained for quiet, suppressed fire. Leaving all of the ports open can reduce the velocity of standard 9mm rounds by about 125 fps. By fastening setscrews in the ports, the velocity is increased to the user’s preference. Also, the suppressors are vented at the front to help eliminate the first-round “pop” that is sometimes exhibited with other sound suppressors. The two integrally suppressed models share similar specs, like the inclusion of Magpul MOE stocks and K2 pistol grips. They also have black Type III hardcoat anodized finishes. But each of our test models had a different add-on to spice things up. First, the UDP-9 IC came with an extended magazine release. For tactical and safety reasons, the magazine release is usually recessed to prevent accidental activations by the operator. However, this model had a new extended release for those needing a bit more speed during a competition. The sample UDP-9 IR, which is the quietest of all the models that Angstadt Arms makes because of the barrel and suppressor lengths, had JP Enterprises’ aftermarket Silent Captured Springs recoil assembly. Due to the nature of its construction and finish, this buffer spring assembly is one of the quietest on the market, making it a natural fit for a firearm like the UDP-9 IR. 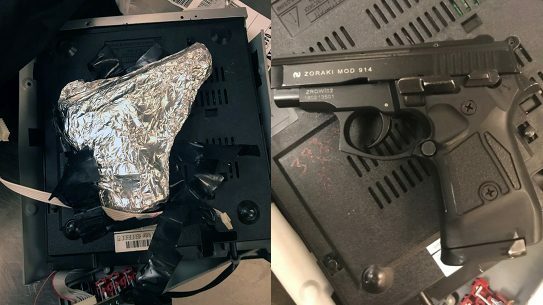 To round things out, Angstadt also brought along its UDP-9 SMG, which is a nice select-fire weapon that won’t care about waking up folks in the next county. As far as size and add-ons go, the SMG was very similar to the PDW. It had a Holosun 503C reflex sight and an SLR hand stop, though it wore a Magpul CTR stock and a Magpul K2 pistol grip. Finished with burnt bronze Cerakote by Carolina Firearms Coatings and sporting a Lantac Dragon flash suppressor, the UDP-9 SMG is almost as much fun to look at as it is to shoot. Though shooting all the toys was why we got together in the first place. With multiple people on hand to try out Angstadt Arms’ different models, it didn’t take long for the giddiness to take hold. Smiles started cropping up as everyone took their turns. Shooting the two integrally suppressed models along with the PDW and the Obsidian 45 was a good bit of fun. It was amazing to hear the difference the suppressors made with the sound levels, even between individual weapons. We ran Winchester and Sig Sauer 147-grain loads through the suppressed models, and even had some Hush 165-grain rounds on hand. With the Hush rounds, the UDP-9 IR was so quiet you were basically listening to the bolt operate and nothing else. Even the shorter carbine model was extremely quiet, though the giggle factor had gone up by expoentially since we had switched it over to full-auto mode. That took things to a whole new level. 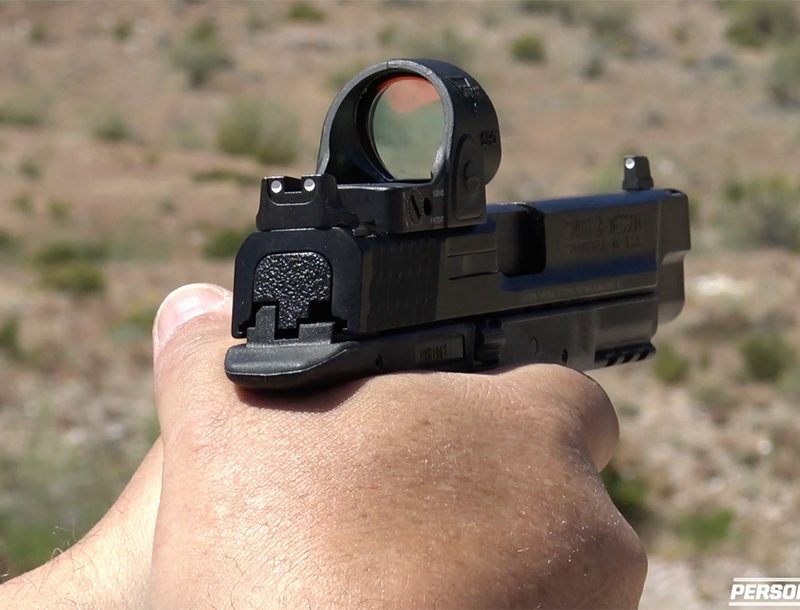 According to Rich Angstadt, the rate of fire of the select-fire 9mm weapons is approximately 700 rounds per minute, depending on the buffer weight and other factors. Rich also pointed out that the operating systems on his products were straight blowback by design. 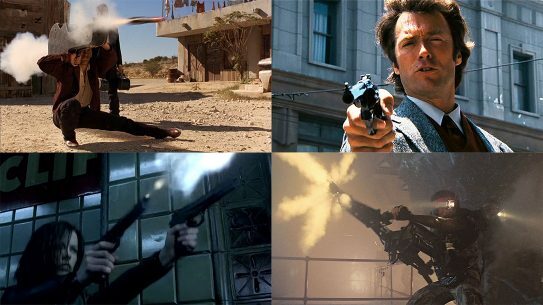 He felt this was a more reliable system for 9mm ammo, especially when firing in full-auto mode. All of the weapons were naturally soft shooting due to the caliber, particularly the suppressed ones. But even the non-suppressed SMG model was very controllable. 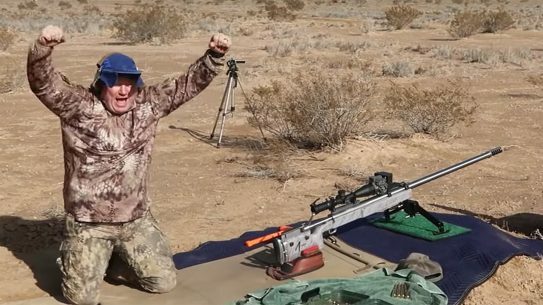 The other writer, Terrill Hoffman, noted that while I was firing, even in full-auto mode, the 4-inch steel plates at 35-plus yards were getting hit two or three times before they fell over. This indicated a good deal of control and accuracy, despite the fast rate of fire. The trigger also helped with this. The average pull for all of the products we had on had was approximately 6 pounds. The break was crisp, and not so onerous that it interfered with quick and accurate fire. Trying out the products from Angstadt Arms was everything we expected and more. The tight lines and professional craftsmanship imbued in each model left us extremely impressed. 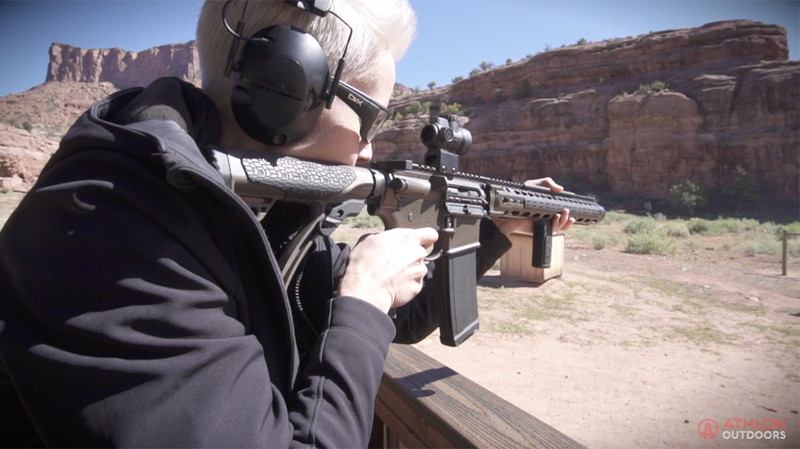 It’s not very often that the average person gets to play around with NFA items, especially select-fire weapons, so having them out at the range was a lot of fun and educational at the same time. When asked about the future, Rich Angstadt said he was excited about the prospects for the company. 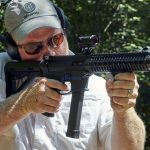 He mentioned that outside the United States, 9mm subguns still reign supreme in law enforcement agencies, who are getting rid of the older MP5 variants and looking for newer designs that are lightweight and easy to operate. The plus side, according to Angstadt, is that a lot of these agencies already shoot Glock pistols. 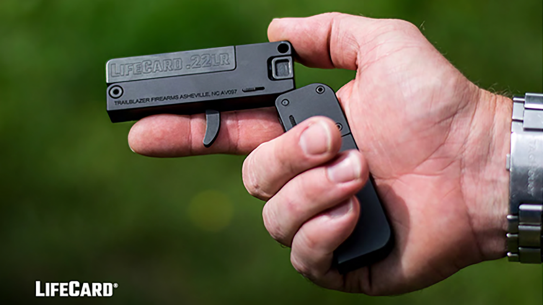 That’s a perfect fit with his company’s products, allowing interchangeability of magazines from pistol to submachine gun. Angstadt added, “Just about everyone in the business knows how to operate an AR, so the training threshold would be very low.” He has already signed up several international distributors, and sees South America and Europe as very promising markets. That said, one doesn’t have to be an international man of mystery to own an Angstadt Arms product. They are, thankfully, made right here in the United States. A visit to your local FFL dealer will get you straight on ordering one from the factory—if it’s not already in stock. The company offers products for the general consumer, such as rifles and pistols. But as you can see from this article, it offers a good bit more as well. 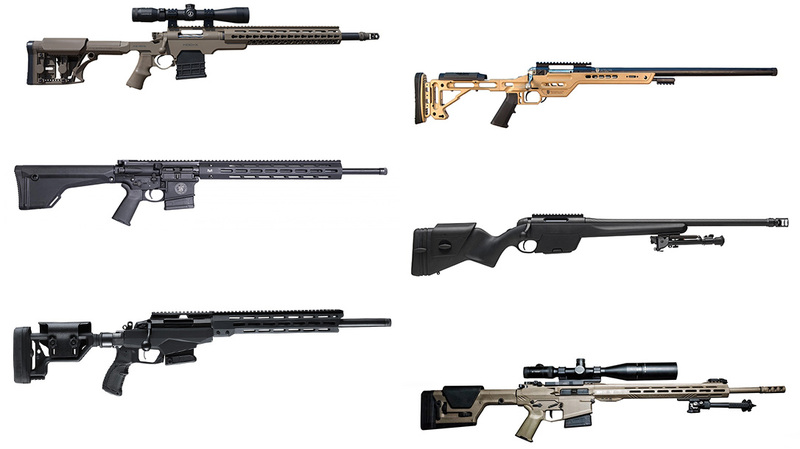 Whether you’re looking for a short-barreled rifle, an integrally suppressed model or a combination of both, Angstadt Arms will have you covered. For more information, visit AngstadtArms.com.